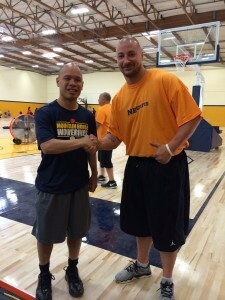 Reno Ursal and Jordan Boreman June ’14[/caption](USA-California-Livermore June 28, 2014) —- The Mountain House Wolverines and NB Courts have formed an alliance in providing quality Amateur Athletic Union (AAU) basketball programs to the Central Valley and Tri-Valley with the opening of a four court basketball facility in Livermore, California. The Wolverines will have the majority of team practices at the new facility located at 6474 Patterson Pass Road. This will be a change from having held practices primarily in Mountain House and Tracy the last three years. In addition to practices, the Wolverines will provide one-on-one skill training with their high school coaches as well as organize tournaments and camps throughout each AAU season. The Wolverines are a primarily invite-only competitive travel basketball club established in 2011. They continually have multiple teams in various age ranges. Their coaches are either current or past high school coaches from Encinal High (Alameda), Orestimba High (Newman), Kimball High (Tracy) and Mountain House High School (Mountain House). NB Courts will hold its official grand opening on Saturday July 12th. For more information on NB Courts, click to http://nbcourts.com or call 925-800-1300. For more information on the Mountain House Wolverines teams, click to http://mhtwolverines.org or email r.ursal@mhtwolverines.org.